The threat of an invasion of Great Britain and Ireland by Napoleonic France recurred periodically during the late 1790s and the early years of the nineteenth century. The government in London made plans in 1797 and 1798 to abandon coastal areas and introduced new legislation for the defence of the realm. This legislation required the lord lieutenant for each county to make returns, especially from maritime parishes, enumerating livestock (farm animals) and the wagons and horses available for transport, and giving the quantity of dead stock (crops stored). There are extant returns for some southern counties in England. During a scare in 1803 about an invasion of Ireland, resulting from the planned but abortive insurrection of that year, similar returns were made under the same legislation, which, after the Act of Union, applied to Ireland. The surviving returns relate to many parishes in County Down and the northern parishes of County Antrim. In reality this was not a formal census in the strictest sense but the surviving manuscripts can be considered a very useful census substitute. The returns for County Down were made to the 1st marquess of Londonderry. Presumably he received returns for each parish, although it is clear from those that have survived that there was considerable variation in their content. Most information is listed in various categories of livestock and dead stock (crops), but in some returns the information also includes numbers of ‘cars and carts’, of people ‘able to drive cattle and load carts’ or those ‘willing to serve the Government gratuitously or for hire’, which underline the concern about a possible invasion. Most of the maritime parishes are covered but the survey also covered some 'inland' parishes in County Down. The returns for the agricultural census of 1803 are included in the Londonderry Papers of the 1st marquess, held in PRONI. The PRONI reference for the census returns is D/654/A2/1–37A–C. There are extant returns for over 50 parishes in Co Down, although for over 20 of these the returns are of no genealogical use since they do not contain the names of any townland occupants. However, the returns of the other 30 parishes constitute a very valuable genealogical resource because they contain the names and townland locations of around 11,300 occupants of property in County Down in 1803 (Researching Down Ancestors, Ian Maxwell, 2004 UHF p. 186). They can provide a valuable link to the tithe applotment returns for the county (1823-1838). 15. Drumbo (approx 500) note 1A has a further 34 for this parish. 25. Knockbreda (359 names) note 1B has a further 32 names for this parish. 36. Includes parishes of Drumgooland (1,159), Drumballyroney (852), Clonduff (734), Kilcoo (512 including 68 for the town of Newcastle), Maghera (26), Garvaghy (364) and Dromara (338). I have had a look at the census for some of the parishes for Co Down. The returns vary by parish and are not consistent. Some, like those in Ballylucas in the parish of Rathmullan were completely handwritten, whereas those for Kilcoo were printed in tabulated form for the enumerator to complete (see above). Those for the parish of Killyleagh (23) are contained in 2 folders and give a detailed breakdown of agricultural produce. The townland of Maymore (Killyleagh), for example, contains the name of only four householders - William Lowry, John Harper, John McCleery junior and James Bishop. Bishop's property in Maymore was substantial - he was recorded as having 4 cows, 3 young cattle, 2 sheep, 3 pigs, 2 draft horses, 2 cars, 60 (bushels) wheat, 52 (bushels) oats, 75 loads of straw, 200 stacks of potatoes to the value of 143 pounds, 1 shilling and seven pence. Further down the Strangford coast an Archibald Bishop was recorded in the townland of Ballymorran in Killinchy parish with 3 draught horses, 5 cows, 6 heifers, 2 sheep, 5 hoggs, 24 (bushels) oats and 3 cars. The latter of course refers to vehicles that could be pulled by horses. Hog was the alternative name for pig. I know of one family in the Limavady area who can be found in the earlier records with the old fashioned name of Hogstin but changed the name to Austin (they were an upwardly mobile family). One of this family opened the famous Austin's store in the Diamond in Derry city, which until recent times was the world's oldest independent department store. Unfortunately, it closed down in 2016. As mentioned the returns for Kilcoo were easy to read as they were written on printed, tabulated paper (Shedule no2): In the townland of Letalian one Donald Morgan had 6 cows, 12 sheep, 2 pigs, 60 bushels of oats, 12 loads of straw & 7 stacks of potatoes. Fifty one names are listed in the townland of Foffanny (and many of the surnames in 1803 are also listed in the tithe book for the townland in 1828). In 1803 Arthur Morgan of Foffanny had 1 sheep, 1 pig, 1 draft, 24 bushels of oats, 1 load of straw & 4 sacks of potatoes. His near neighbour James McLaughlin had 3 cows, 6 sheep, 2 pigs, 1 draft, 40 bushels of oats, 2 loads of hay, 5 loads of straw & 35 stacks of potatoes. The 1803 agricultural census is not only a useful genealogical source because the records are broken down by townland and parish. 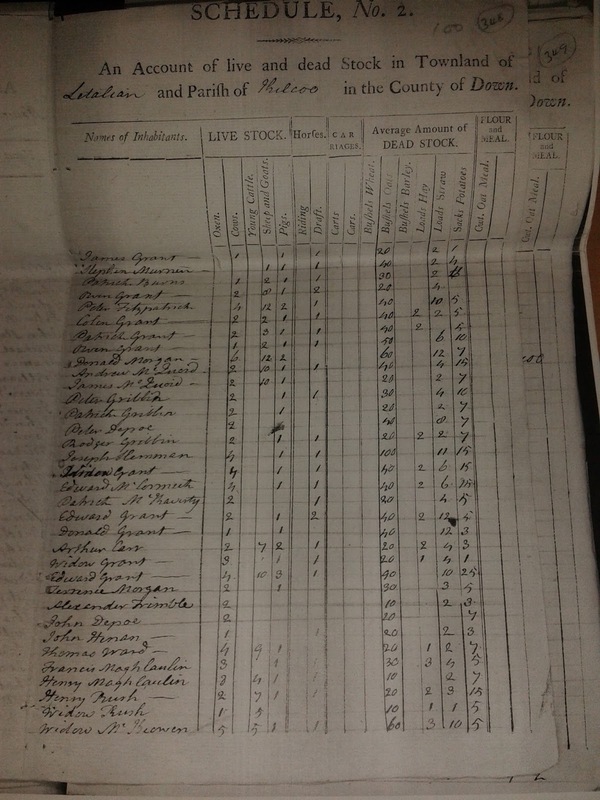 It also gives an interesting insight into the economic and social standing of those who were recorded in the manuscript and opens pathways for investigating other source material for those who had sufficient means to leave legacies in the form of wills or who had strong leases on their farms so estate records and registry of deeds should be also be checked. Such people may also have been of sufficient means to erect a family headstone and a search of the local graveyards might also be productive. 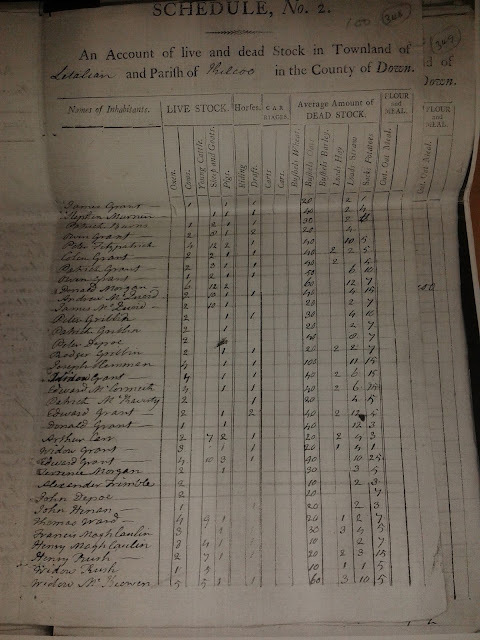 The Agricultural returns of 1803 are a most valuable census substitute and provide a fascinating insight into the social and economic lives of the people who resided in the maritime areas of counties Antrim and Down at the turn of the nineteenth century. Almost 19,000 individuals are named and identified by townland and parish and detail is also given of their economic status. For those who may have had ancestors who resided in the parishes covered by the survey it is a source that should be consulted and utilized.